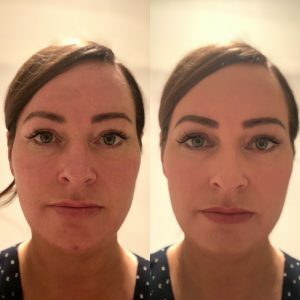 As the founder and CEO of a brand that promotes people owning their own style of beautiful, Francesca Webster wanted to share her own personal and very recent beauty experience with you with real before and after pictures. I'm 46 years old and the last time I had lip filler was 4 years ago and lip filler was the only filler I've ever had to date. The reason for lips fillers? I'd lost both volume and shape, I could not wear lipstick without a lip liner and had fine smokers lines around the edges, which my lipstick would love to bleed into. 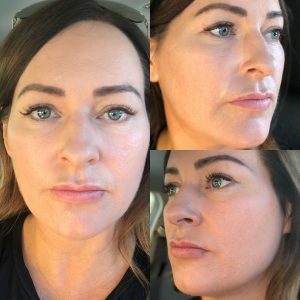 My personal concerns about lip fillers were that I didn't want to look overdone as I do indulge in quite a few advanced skin treatments, PRP being my absolute favorite. 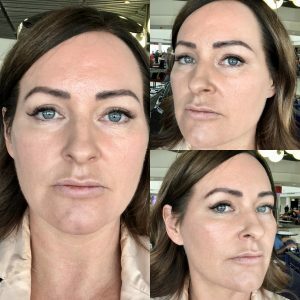 I wanted a lip result that matched my approach to beauty, I wanted a result that looked natural and if I'm perfectly honest, I wanted my lips shape and volume to be the same as I had I had 15 years ago. I understood that my volume loss was not just in my actual lip, but the area around it and for me specifically the area above it. The cupid bow or the philtral column as its known in the medical field. Swing in Registered Nurse and dream cosmetic injector Liam from Brazilian Beauty Creek Street. Liam pointed out to me that its about addressing the 'total face' and my own personal focus on my lips was only a small part of the story. Liam talked about balancing my overall face with the addition of cheeks and chin. Hmmmm, chin? Chin was the last thing I was expecting Liam to mention, I'd never really looked hard at my chin or given any thought to it. I trusted Liam's advice on balancing out the entire face and went ahead with lip, cheek and chin fillers. 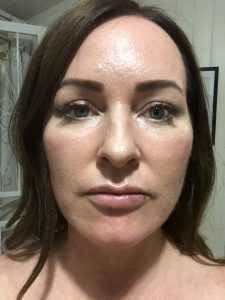 Liam applied 0.6 Ml filler in my lip area with a focus on rebuilding my Cupids bow, applied 1 ML to my cheeks (0.5 ML in each side) and 2 ML of filler to reshaping my chin. Its been 4 days since my first treatment, I 100% LOVE the results from this treatment, especially the chin. 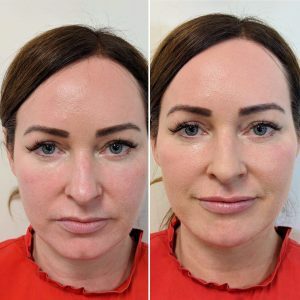 This treatment has subtlety freshened up my whole lower face area, put a spring in my step and I can confidently say that Liam was right 'chins are the new lips !'. I can't wait for my next treatment and I'll keep you updated with the results. Before and directly after my treatment. I was surprised at the lack of swelling directly after the treatment, the filler products contain a local anesthetic. When I left the clinic I felt a little sore but fine to go out for dinner with friends. Late evening on the day of the treatment - Swelling and bruising are beginning to appear and local anesthetic has worn off. The next day, lots of swelling and sore. Overnight the treated areas became sore especially the lips and chin. I needed to ice both areas frequently. 2 days post treatment - The areas are still slightly swollen and bruising has appeared which is easily covered with mineral makeup.I'm really happy with the Cupids Bow. 4 days post treatment with and without makeup. Everything is settling down and feeling like I'm almost back to normal. I applied my lipstick today without a lip-liner. Interested in Cosmetic Injections? Find out from our RN Liam what you'd expect from a Cosmetic Nurse consultation.